was a very interesting experience. I pretty much ran from our motel, around the perimeter of downtown Reston, and back. Only about 3 miles total. It's AMAZING to me how many people live within and around that 3 miles. Apartments upon apartments, upon condos, upon townhouses.... and I barely wound around any of the side streets that are filled with housing. One could live around here and never need to own a car. It's pretty incredible. I think it would be fun to live in a city...at least for a little while. It's a beautiful morning. I even found a running "super highway"... at the end of my run, so didn't follow it very far. But there were quite a few people going up and down it. I'm finally looking forward to today. I'm ready to learn how to continue to grow as a leader. We made it to Reston, VA. There is some beautiful country between MI and here. We spent all day in a van, and it's nice to be out of it! Tonight we walked around downtown Reston. A very cool place. Having lived in the country, basically all of my life, I'm always fascinated with cities. It was cold and rainy when we got here, but it actually turned out pretty nice. We discovered we can just walk from our hotel to the Hyatt, downtown, where the Whiteboard Conference will be. It should be a good day tomorrow. Stress - I think I need a vacation! Fletcher Medical Center in Burlington. 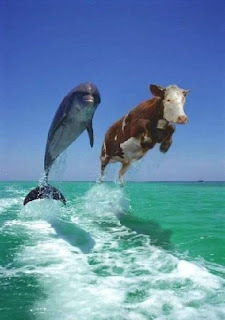 Look at both dolphins jumping out of the water. The dolphins are identical. A closely monitored, scientific study revealed that, in spite of the fact that the dolphins are identical, a person under stress will find many differences between the two dolphins. The more differences a person finds, the more stress that person is experiencing.. I am getting ready to head to the Whiteboard Conference in Reston, VA, with some of the other C3 staff in the AM. It's going to be a flying trip. Down, back, plus conference in less than 48 hours. The conference itself could be very interesting. Eight church leaders each get 1/2 hour to talk about a leadership principle. I'll let you know what I think. You can check it out here. P.R.A.C.T.I.C.E. Definition: A custom or habit of doing something. No one ever pours new wine into old leather bags. Otherwise, the new wine will break the bags, and the win will be ruined along with the bags. But new wine should be put into new leather bags. “If you want to succeed, you should strike out on new paths rather than travel the worn paths of accepted success.” John D. Rockefeller Jr. Kids want fun and excitement, but you know what? So do adults! We're really the same. Have you ever sat through a boring meeting, lecture, or presentation? How much did you learn? If you're like me you zoned out, planned the rest of your day, or thought about something that was much more interesting. Now think about something you did that was fun and exciting? Where was your attention? In your planner or email? Or was it focused on what was happening? We have got to create exciting and fun learning environments for our kids. What we have to teach these kids is so incredibly important that we don't want to make it dull and boring. We are impacting their futures and their eternities! If you are having fun and feeling excited about your serving experience, than keep up the great work. If you're not, talk to us, let's work together to better create a fun and exciting environment OR help you find a different place that is fun and exciting for you. Because it begins with you. If you are having fun, the kids will too! My greatest desire for each of you in your volunteer roles is that you fulfill your role with excellence. Excellence means doing the best you can do. It does not mean perfection. None of us are perfect, so that's out of the question. But God deserves our best. Our kids deserve our best. Let's give them our best! Whether you're setting up, presenting the lesson, working with a small group, or doing potty breaks, do it with Excellence and watch how lives are changed! Are you creating an exciting, fun learning environment with EXCELLENCE? If not, what do we need to change? Affirming, honoring, and valuing others through authentic leadership. I bet it was amazing to be one of the twelve disciples. Talk about authentic leadership! Jesus was the BEST at affirming, honoring and valuing His team. He praised them and He coached them. He even had to reprimand them on occasion. The disciples respected Him and loved Him because of the leader he was. My mom also makes me think of authentic leadership. I don't think there has ever been anyone as affirming, honoring, and valuing to me as my mom. Mom's are like that. Mom's are great leaders. In Kid Crossing, the Director Team and I value our volunteers more than we can ever express. There is no way we could begin to change and impact kids' and families' lives without you guys. It is our goal to affirm and value you. We will do our best to provide you with authentic leadership; to let you know when you're doing something well, and to coach you in ways you can do your job even better. You are also leaders. Many of you directly lead groups of kids. Just like the Bible verse today says, you need to encourage and build up the kids you influence. Let them know you value them. Affirm them on Sundays, but also throughout the week. Maybe it's a phone call, an email, or a note in the mail. Kids love to get stuff like that. Make it your goal this week to affirm, value, and honor each person you come in contact with this week. Whether it's your child, or the cashier at Meijer, show them authentic leadership. You will be leading, even if it's only to get the cashier to smile ! How will you affirm, value and honor the kids you interact with, or the people who look to you as a leader? Risking failure through innovation and reinvention of programs. Thomas Edison, great inventor, set out to create an electric light. The first one he made didn't work. Neither did the second or the tenth, or the 100th or even the 1000th. But Edison didn't give up. He was willing to risk failure because he knew that eventually he would find the right combination of materials that would succeed, and that when he did succeed it would be a HUGE success. Each time his light bulb didn't work, he didn't look at it as a failure, he looked as it as a learning process. He now knew what wouldn't work! Each time he was one step closer to success. Finally, somewhere around the 10,000th time, he succeeded. And can you imagine how much greater his victory and his excitement then, than if it had worked the 2nd or 3rd time? Edison wasn't afraid to risk failure and to reinvent and rework what he was doing until he got it right! He was just making light. How much more should we be willing to risk failure and keep working and reinventing when what we're working on, kids and families lives, their eternities are at stake? The way we do things at Kid Crossing and at Crossroads rarely stays the same for very long. The reason is that we want to find the very best way to change lives for eternity. As we bring this school year to a close, and look towards the summer and next school year, we will be reinventing some aspects of what we do. Every time we do that we risk failure, but every time we fail, we can look at it as one step closer to achieving the ultimate success! Risking failure isn't easy. I HATE to fail! But the victory of success when we finally succeed makes taking that risk totally worth it! Protecting children with an uncompromising safety process. If one of these little children believes in me and someone causes that child to sin, then it will be very bad for that person. It would be better for him to have a large stone tied around his neck and be drowned in the sea. In Kid Crossing we want kids to learn about Jesus, we want them to become Forever Friends with Him, and we want them to grow in their relationship with Him. But we want this all to happen while they are safe. Safety is a key concern for families. Safety covers a huge area in Kid Crossing. From check out, to bathrooms, to who's in your area, our policies are mainly developed around keeping both you and our kids safe. I recently met with a children's ministry director from another church. One Sunday, not too long ago, she had one girl who passed out cold in the hallway. While people were around trying to help this girl, someone else came up and told this Director that a 2 year old had just had a seizure. After a lot of running, parents were called, 911 was called, and everything turned out OK in the end. But that conversation put things like two bathroom “accidents” in one area, into perspective for me. And helped to remind me that we've got some great systems in place to keep our kids safe and to help us when we have emergencies. We have a safety team and we have radios. But that's just one way we keep our kids safe. We do it through background checks on volunteers, by checking out every child, no matter who they belong to, by asking strangers in our areas if we can help them, and by not giving out any information about a child to anyone. Obviously, God wants us to keep our kids safe. As we look at the Bible verse today, we see Jesus uses some pretty strong language about those who don't keep kids safe. Our systems and our kids safety is only as good as what we make it and how we work together to follow our policies. Thanks for the great job you doing caring for our kids and keeping them safe! Keep it up! Am I doing all I can in my volunteer role to Protect kids with uncompromising safety? We, the Kid Crossing directors, finally decided on a name for our Sunday morning gathering time. Actually we're using a name I learned from Promiseland at Willow Creek Community Church in Chicago. We're calling it V.I.P. time. One, because our volunteers ARE very important people. And two, because we giving Vision (V), Information (I), and Prayer (P) during that time. Three weeks ago we started looking at volunteer P.R.A.C.T.I.C.E.s. These are included in the Kid Crossing volunteer handbook. I got these from Craig Jutila, and Saddelback's Children's Ministry. I will post them here as we add to them each week. The actual practice, Bible verse, and quote come from material from Saddleback. The random thoughts on each section are mine. I fell off the blog wagon yet again :) So, if you're one of the two people who have mentioned it in the last two months, the following posts should make up for it :) There's always lots of stuff going on in Kid Crossing and in my life! Maybe that's why I keep forgetting to blog. Oh well... Here's yet another try.